During spring and summer, the sight of large bees buzzing around your home’s exterior might be alarming. These bees, known as carpenter bees, rarely sting, but they can leave unsightly holes in your home’s exterior. Learn more about these bees, including when you should look into South Carolina carpenter bee control to protect your home. Carpenter bees are commonly mistaken for bumble bees, since they’re both around the same size. 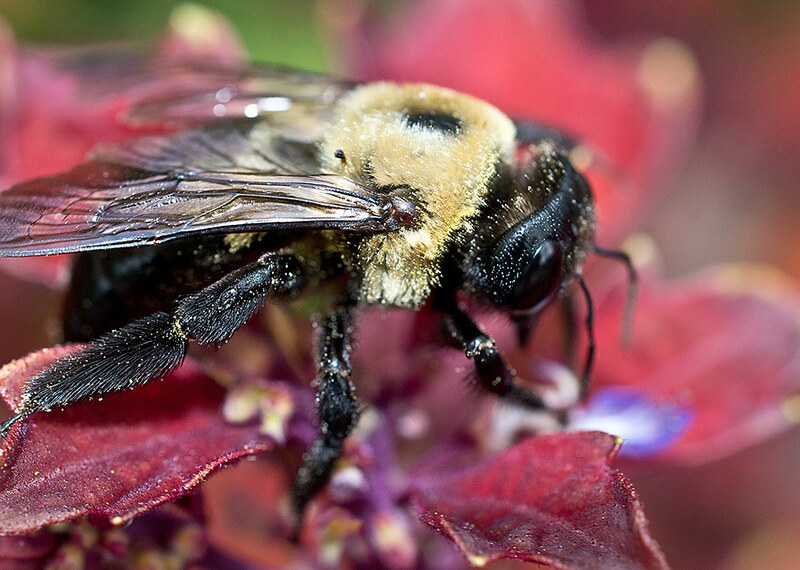 While bumble bees have fuzzier bodies, carpenter bees have smooth, mostly hairless ones. Carpenter bees can grow up to one inch long as adults. They’re mostly black with orange, yellow or white hairs on their thorax. The males have white markings on their heads. Carpenter bees spend the colder winter months hiding in empty nesting tunnels. Before winter arrives, they stay busy gathering pollen to store inside these tunnels. Young adult carpenter bees leave the tunnels in early spring in order to mate and establish new nesting sites. Females deposit their eggs in old or new tunnels and leave behind a mixture of nectar and pollen for their offspring. They close up the cells that the eggs are in with pulp from wood. After the eggs hatch, the larvae remain in the cells until they become adults, which usually occurs later on in summer. When they’re ready to leave, they chew their way out of their cell. Carpenter bees are not generally considered a threat to humans or pets as other bees are, since only the females have stingers. Males often fly aggressively toward people in order to guard their territory, but they’re unable to sting. While these bees aren’t threatening to humans, they can cause damage to your home’s exterior. They can leave holes and stains on the exterior as they dig their tunnels and leave excrement behind. When they keep using the same nesting site and tunnels again and again, this can lead to serious structural damage and the need for South Carolina carpenter bee control. Carpenter bee infestations must be dealt with properly, or you can end up with additional damage to your home. This generally involves spraying insecticide into the openings and tunnels that these bees have made, which is usually done in the evening. This helps ensure that the bees are inside the tunnels at the time. Roughly one day after spraying, the holes should be sealed up. Keep in mind that if the insecticide doesn’t work, the bees can dig new tunnels in order to get out, which causes even more damage. It’s important that the holes are sealed up to prevent more carpenter bees from using them again. Our team of experts can provide you with dependable South Carolina carpenter bee control to safely eliminate these pests from your Hilton Head property. There are steps you can take to keep carpenter bees from making holes in your home’s exterior. These bees tend to prefer digging through wood that is unfinished and unpainted. Covering your home’s exterior with paint helps deter these bees from using it for their nests. You should also close up any holes from nails that are on your home’s exterior. Keeping your doors and windows closed during spring and summer also helps prevent these pests from getting in and setting up nests. If your home exterior is made of vinyl or other materials that aren’t wood, you’re unlikely to have a carpenter bee problem. However, they can also damage other wooden structures on your property, including chairs, sheds and picnic tables. If you’re having a carpenter bee problem at your Hilton Head home, please contact Island Pest Control. Our experts provide reliable South Carolina carpenter bee control to prevent these pests from damaging your home’s exterior.